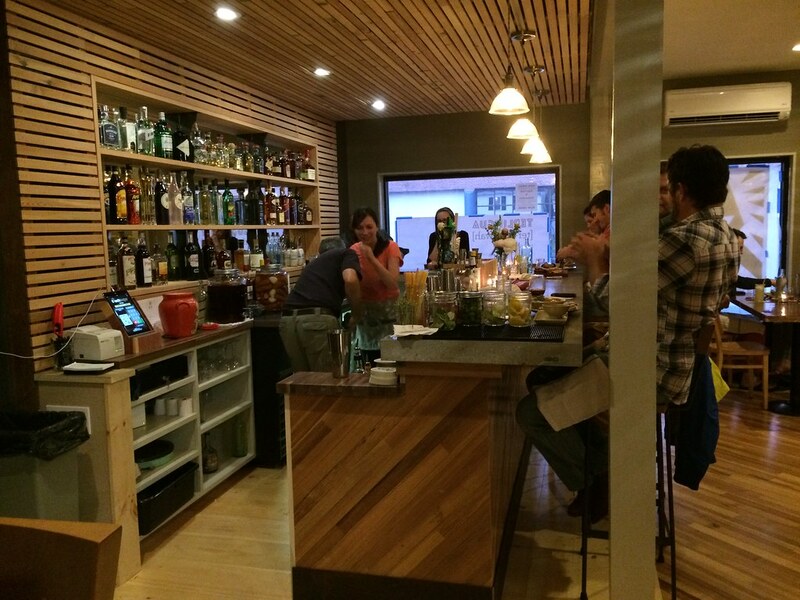 First Look at Terlingua - Opening Tonight! My friends Melanie and Pliny Reynolds are opening a restaurant on Washington Avenue, called Terlingua (opening tonight at 5pm!). I am predisposed to love it, since I a) love Mel and Plin and b) have always enjoyed any of the food they prepare. Pliny lived in Austin for a while, so he's got the barbecued meats thing on lock. Their friend Wil Rothschild is in the kitchen, and every time Wil's made dinner or brought some dish to a potluck, it's always amazing too. Wil has cooked in the Caribbean, and his bold use of seasonings on seafood reflects that. Terlingua occupies the former home of Chez Biso Na Biso on Washington Ave., a few doors down from Silly's. Pliny and his construction team peeled back the layers of "renovations" in the space, gave the systems a much needed upgrade, and slowly brought the space back to an usable restaurant. They've upcycled the poured concrete bar from El Rayo's Cantina and stools and tables from Nosh. The space is painted a cheerful red, but is lightened up by the lathe that covers behind the bar and separates the kitchen from the dining room - but still provides a bit of permeability, allowing the excitement of the kitchen to spill over without being distracting. Joe Ricchio is behind the bar on Mondays and Saturdays and was pouring drinks for the friends and family dinner I attended on Tuesday. The draught beer selection is Dogfish Head-heavy, as Pliny is related to a brewer there, and I enjoyed a Jolly Pumpkin sour. That night there was also a spicy margarita (MargaRicchio) and some delightfully dry red sangria. To start, I enjoyed the pork belly chicharron and the smoked fish dip; the other starters are a lettuce leaf salad, red snapper ceviche, a summer corn salad, and shell-on shrimp. 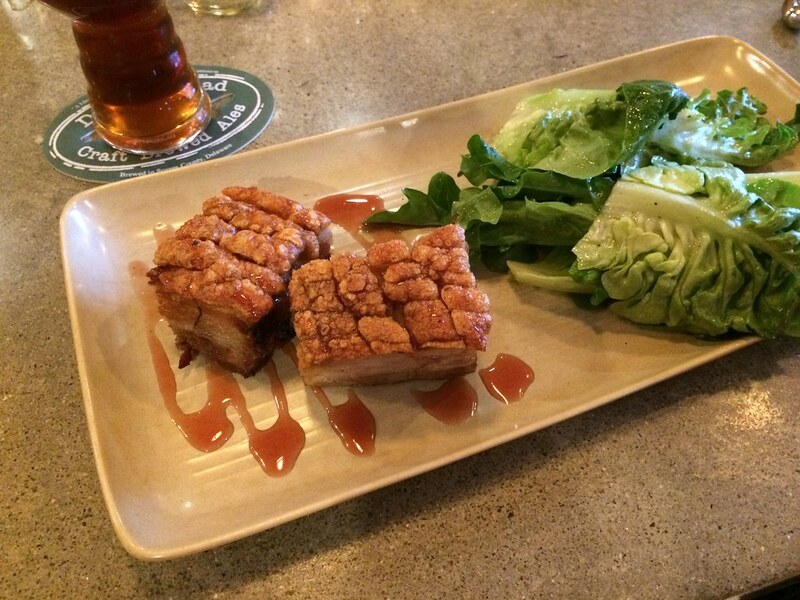 Everything was fantastic - the pork belly that hard-to-achieve combo of tender, but cooked enough to render the fat palatable, then topped with the crunchy pork skin. The whitefish was very smoky and flecked with crunchy bits of onions and peppers. 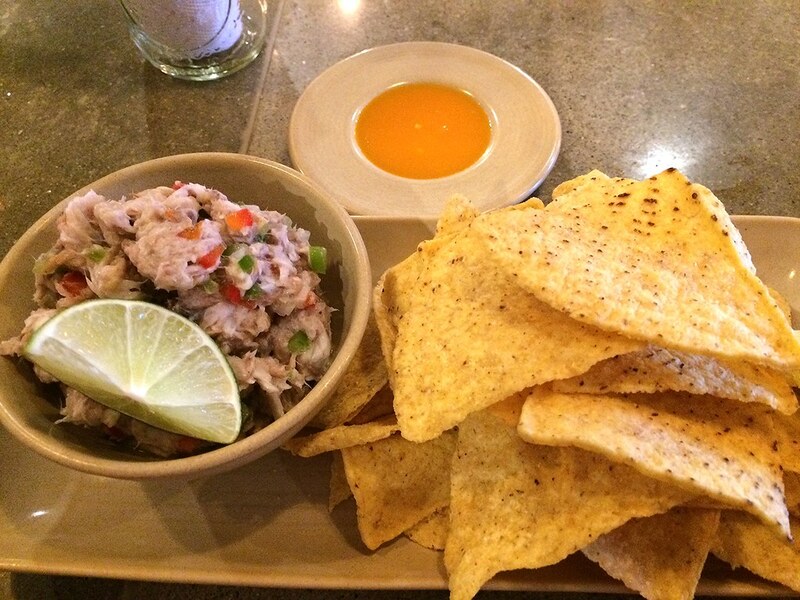 The accompanying habanero dip added a nice slow burn. A. and I shared the red chili with smoked brisket (pictured below is large portion; it's also available as a half), and we had a hard time choosing it over the green chili with smoked pork. Other entrees include a veggie empanada, stuffed poblanos, pozole, beef tongue and cheek tacos, and a barbecue board, that night featuring brisket. The entree prices range from $7-10 for half portions and $13-18 for full (can I tell you how much I love that they offer half portions??). 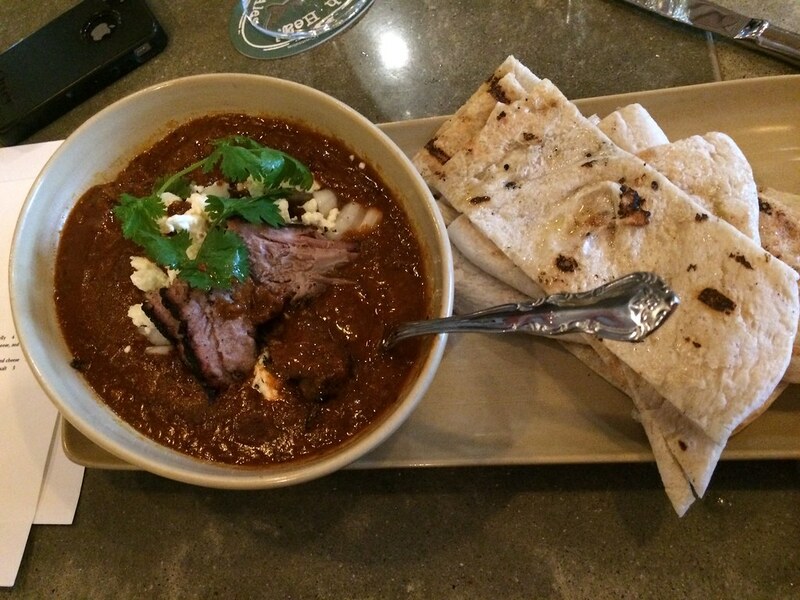 The chili was nice and smoky - flavorful, but not too spicy, and the brisket was very tender. The salty farmers cheese, diced onions, and cilantro were the perfect toppings. For dessert, we enjoyed a perfectly gooey tres leches cake, made by East End Cupcakes, with a crustless pecan pie and a housemade apple pie or sorbet available too. Terlingua nails it right out of the gate - fantastic food; a friendly, neighborhood vibe; and prices that will allow you to pop in frequently. I'm so happy to see my friends realizing their dream of opening this restaurant in Portland, and hope that once you get there, you love this casual, barbecue-ish restaurant as much as I do. The fresh strawberries are starting to appear in the markets here in Southern Maine (!!!). I see strawberries as the official start to the short Maine preserving season - for one, strawberry jam is one of my favorite types of jam, so it's the first Maine-grown produce I feel the need to capture in large amounts. When the berries are in, I hear the firing of the starting gun. The race is on to put up my favorite produce - and our in-season, local fruit is high on the list. That said, I also thinking jamming, in general, and strawberry jam, in particular, is one of the more finicky things one can attempt in food preservation. Some knowledge and experience is required to get fruit jams to "set" or to have that jam-like, spreadable texture (versus a runny fruit syrup). 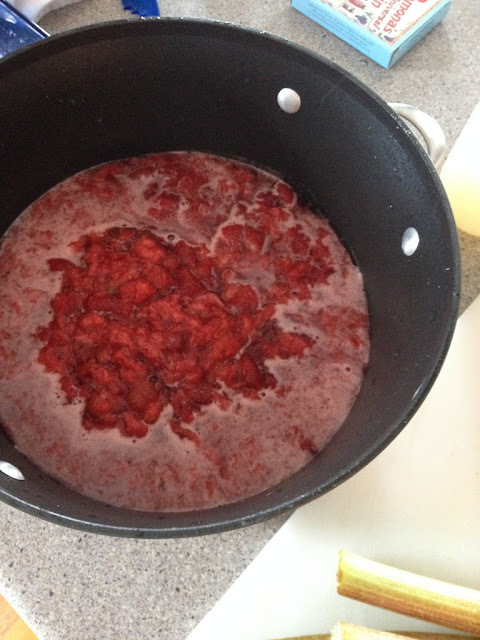 And then strawberries have their own issues, like foaming and floating, that can confuse or worry a newbie canner. I've written tons on how to best preserve strawberries, but here are the highlights: my favorite recipes for the New England canner who is as excited about the first fruits of summer as I am. For jamming, I turn to Pomona's Pectin - it's available at natural foods stores, Whole Foods, and online. Pectin is the stuff in fruit that bonds with sugar and water to create the set. Manufacturers extract pectin from fruit, dry it, and powder it, so you can be sure your jam or jelly will set. The thing is, most pectins require the addition of sugar to work. If you're looking to avoid sugar completely or use an alternative sweetener for whatever reason (flavor, health, fun), you're out of luck with most commercially-available pectins. Pomona's is uniquely formulated, in that it does not need sugar to set! No sugar needed means you're free to use any kind of sweetener you want: honey, maple syrup, agave, Stevia, Splenda, and of course, white or raw sugar, just maybe less of it than some recipes call for. My favorite strawberry jam made using Pomona's Pectin is this strawberry rhubarb jam, using a robust honey from my friend SK. The honey flavor complimented the tart rhubarb and strawberries nicely and stood up to the fruit, whereas a mild honey would disappear. I've also made low-sugar strawberry jam using SureJell's No Sugar Needed pectin (no sugar in that you can use Splenda, but it's also a reduced sugar pectin). The recipe calls for 6 cups of fruit and 4 cups of white sugar. I think the flavor is perfectly sweet without being cloying or losing the fruit flavor, but the more I become used to my low-sugar jams made with Pomona's, the more I find it's on the sweet side. This recipe would be perfect for someone who is used to a full-sugar jam, but is looking to use less sugar without freaking out their sweet tooth. While I love the classic strawberry jam, add-ins are fun, like vanilla extract or herbs. I'm enjoying the strawberry basil jam from my friend Sue at Above the Dam Jam that I bought at the Kennebunk Farmers Market. She adds whole basil leaves while the fruit is cooking, then removes them before canning. I've steeped whole herbs like lavender and mint in with my strawberry mixture, adding a subtle complexity to the final product. Bourbon and vanilla add a nice touch too - if you're lucky enough to have been given or if you make your own, a splash of Bourbon vanilla extract adds some sweetness, which will in turn help you reduce the sugar in your jams. I've also added a vanilla bean to my sugar before jamming, to infuse the sugar with a slight perfume of the spice. I've got Love and Olive Oil's limoncello strawberry jam bookmarked for this year. A lof of these projects might not take place in the next few weeks, since I use my freezer to preserve the berries first. I pick my own fruit, then wash, dry, and hull the berries. After they're packed into freezer-grade plastic bags, I stow them in the freezer until I either run low on strawberry jam or until I have more time to undertake a more elaborate project like canning. Jam also freezes well, and several pectins are available that don't require cooking to work. That means there's more fruit flavor making its way into your jam, and in the middle of winter, your tastebuds will be particularly wowed. 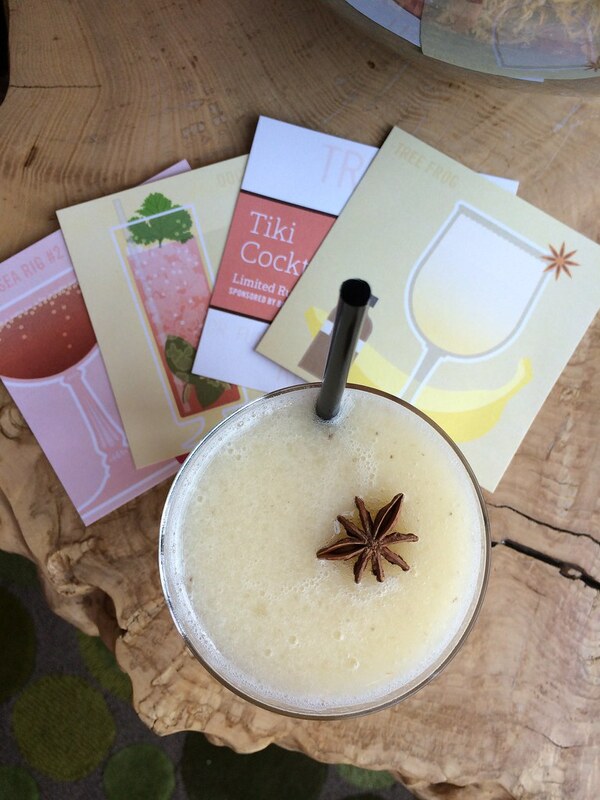 I'd been looking forward to Saturday's tiki cocktail seminar ever since Briana Volk, of Portland Hunt & Alpine Club contacted me while planning the event months ago. It was part of the 2nd annual Portland Rum Riots - a celebration of craft cocktails, spirits, and bars on the anniversary of a riot during Maine's long prohibition against alcohol. One hundred and sixty years later, Maine may have some residual legal hang-ups over alcohol, but inside Hugo's on a beautiful Saturday afternoon, it was nothing but rum-soaked tropical fun. 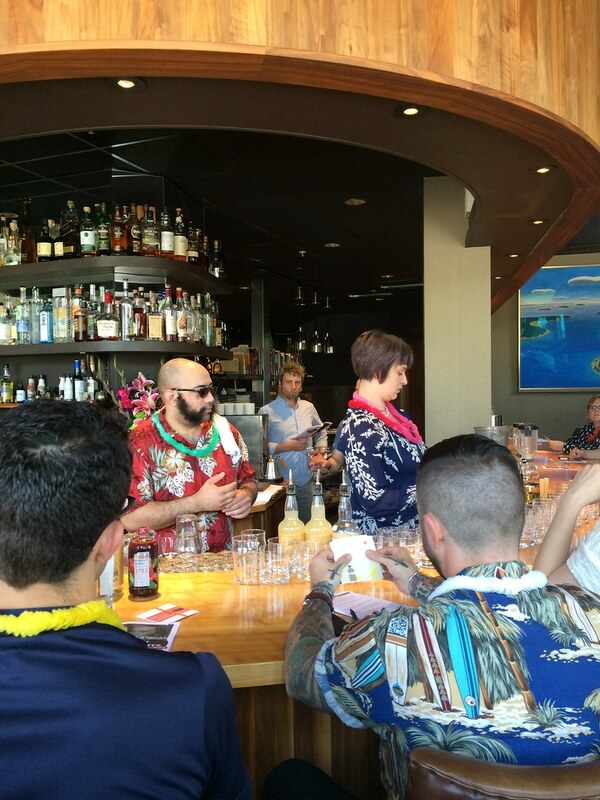 The event was lead by Christian Gaal and Phoebe Esmon, who run a tiki bar, the Yachtsman, in Philadelphia together. Christian was the storyteller, while Phoebe whizzed up drinks and provided technical advice about syrups, drams, and other classic tiki ingredients. We started with the Tree Frog - a blended drink with Plantation rum, allspice-galangal syrup, fresh lime juice, and banana. I don't know about you, but if I'd seen this on a menu, I might have shied away from it, because of the allspice and the banana. But it was lightly fruity and not too spicy, perhaps balanced by the fresh squeezed lime juice and the slushy blended ice (recipes to follow). This drink represents the "new wave" of tiki - not overly sweet, elevated, and still made with traditional tiki ingredients (namely, rum!). Next up was Red Sea Rig #2, an original cocktail created for this event. 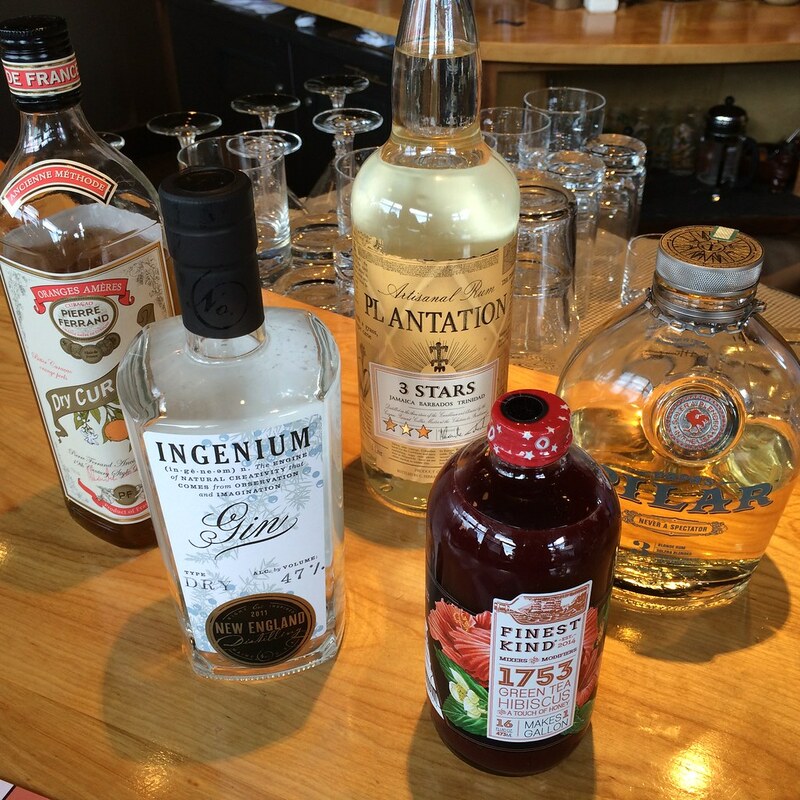 It uses several local products: New England Distilling's Ingenium gin and Finest Kind green tea hibiscus concentrate. It was tart with a faint undertone of warming spices from both the Ingenium gin, which uses unique Southeast Asian botanicals, as well as the allspice dram. At this point, the instructors took a break and let us socialize. As you'd expect, there were a lot of interesting people there - I learned about a local cocktail club (like a book club, but with wine) and made plans to have a tiki party this summer (big surprise: everyone is very enthusiastic about tiki after two rum drinks!). We also noshed on Eventide snacks, including the Holy Grail of bar snacks: the brown butter lobster roll. After the cats' attention was herded back to the bartenders, we learned about the Doctor Funk of Tahiti, from Trader Vic's Bar Guide, published in 1947. Christian's stories during the serving of this drink included the history of absinthe and the bastardization of grenadine (really, check out how to make grenadine, you'll be shocked when you see what it's actually supposed to be made from). Again, another ingredient that might make one wrinkle one's nose - absinthe - blended in surprisingly nicely with the dark rum, simple syrup, grenadine, and citrus juices, creating just a touch of herbal notes that left one wondering, rather than overpowering. If you're sad you missed the Rum Riots events, there's still time! Tonight is the "closing ceremony," if you will, at Central Provisions. 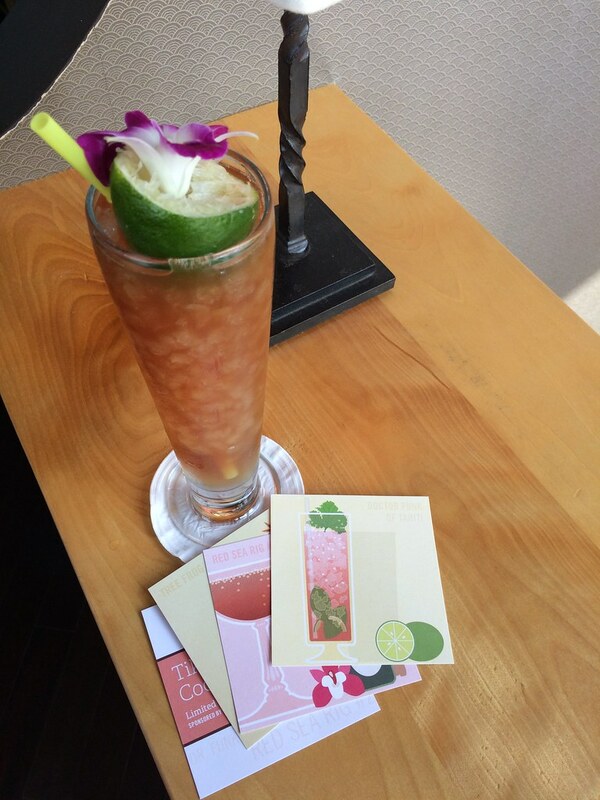 Happy hour starts at 5pm with rum drinks from Plantation rum. Blend. Serve in a red wine or daiquiri glass. Garnish with star anise pod. 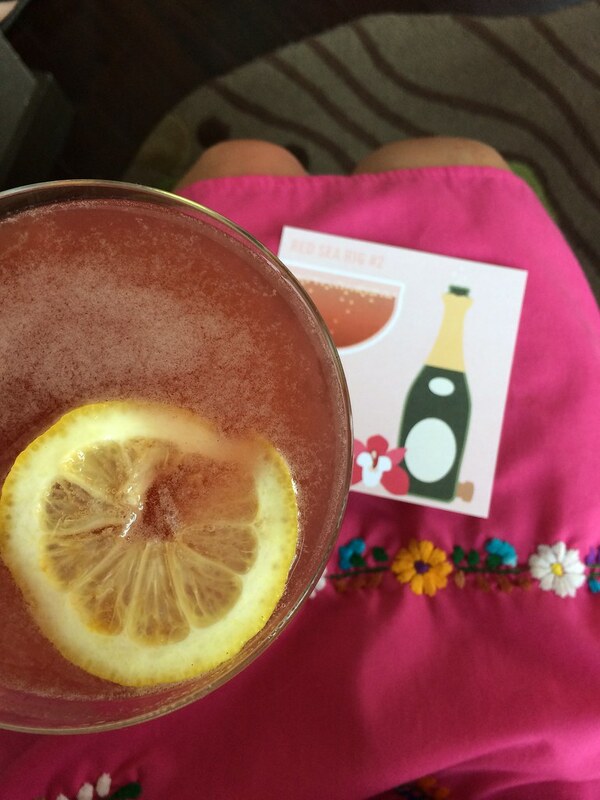 Shake in a cocktail shaker, strain into coupe glasses, top with Cremant de Limoux bubbles. Garnish with lemon wheel. Shake with crushed ice, strain into Pilsner glass, top with a splash of soda water. Garnish with orchid or fruit. The beautiful recipe cards were designed by Might & Main, a local design and branding firm.